Surfing the net, I came across a new product that was visually as stunning as the idea was innovative. Luminous fabric. 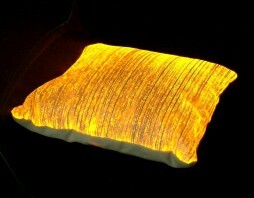 The Luminous Fabric is fabric that glows or lights up adding a new dimension to cloth as we are used to seeing it. This innovative concept allows weaving of optical fibers alongside synthetic ones to create a fabric that lights up. The uses of this fabric are immense and one can utilize the technology in clothes, home décor, accessories etc. The company has created a range of products that are an ode to the versatility of the fabric. Your bedroom would get a new dimension with the Heart Pillow. This red pillow comes in two sizes and can light up for more than 10 hours, thanks to replaceable batteries that are hidden inside. A small switch inside the pillow helps power it on or off. 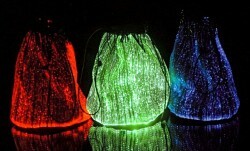 Just switch it on and get ready for a dazzling and luminous effect in your bedroom all for about $170. Guaranteed to enhance bedroom activity! So get ready to dazzle with Luminous Fabric and watch your life light up. Can You Survive The Darkest Dungeon? I like the effect but I don't need anything more that requires batteries!